Living in the Body Studio. Classes & private sessions formed by request. Here you’ll find general information about classes and private sessions with Wendy Hambidge. To contact Wendy regarding forming a class, private sessions or a consultation, visit the CONTACT page. Example private sessions, curricula, and class descriptions below. Design your own class with colleagues, friends, or in consultation with a project. Body-Mind Centering®. (BMC℠) facilitates self-awareness and a deep understanding of the body that can be applied to any area of self or physical inquiry. Taking BMC work into a performance process, yoga training program or group somatic practice is a way to explore and research embodiment from an anatomical point of view—grounded in the body’s psychophysical and developmental patterns. Classes are developed and evolve in coordination with each client. Class size can be intimate to large-scale. This series of classes is an introduction to the experiential approach to anatomy of Body-Mind Centering. A primary tenant of BMC states that every part of the anatomy, micro to macro, has the capacity for awareness. In this course, we build awareness of the body's individual parts and systems to understand the whole. The study of Yoga through embodied anatomy will bring ease and depth to your practice. 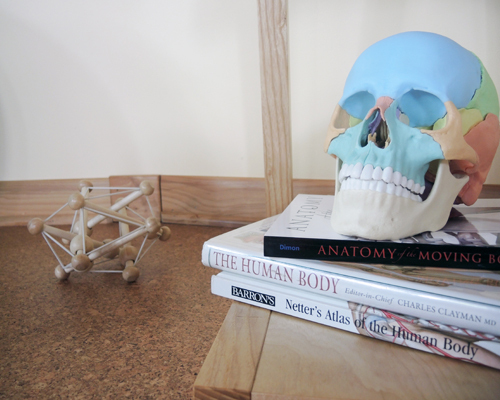 Touch, drawing, anatomical texts, and movement are used to build knowledge of the fascinating world of anatomy as it relates to a deeper, sustained Yoga Practice and movement. This series of classes provides support for infants in the transition from womb to the world. Infant movement develops crucial neural pathways that provide the foundation for healthy cognitive and physical growth—preparing baby for an engaged life. Parents will work to understand the relationship between the stages of infant development and their baby’s movement. Providing parents with tools for deep nurturing and bonding during their child’s fundamental first years. Curriculum currently in development. Check back for updates! Anatomy of a private session. Design an individualized series of sessions for a concentrated approach to applying Body-Mind Centering to any area of movement inquiry and therapy. Private sessions are personalized and developed in coordination with each client’s areas of need and interest. Individual sessions are designed to connect clients to their body’s inherent intelligence, self-awareness, and provide individuals with the tools for accessing wellness through movement and somatic inquiry. Private sessions often include the use of imagery, hands-on-work, movement, and experiential anatomy. This could involve floor work, meditation, visiting some anatomy books or work on the massage table. We may begin work with a point of injury, a system of the body (muscles, bones, nervous system) or with developmental patterns. The shape of each session may vary. The primary goal is always comfort, ease, and listening to your body without judgement. Infuse play time with supportive early learning and deep bonding with private sessions. The first year of your baby’s life is crucial to their development and the adult they become. Private sessions offer parents and caregivers more individualized tools to support their little one’s organic developmental patterns and milestones. Participants will work to understand the relationship between the stages of infant development and their baby’s movement. Providing parents with tools for deep nurturing and bonding during their child’s fundamental first years in concentrated sessions.